Easy appetizers sure to please your avocado and bacon lovers. Add pepper jelly to softened goat cheese (room temperature). Mix until smooth. Set aside. Slice prepared polenta into 1/4 inch thick pieces. Hint: You can buy polenta in round packaging or prepare your own. When preparing your own, slice into 1 1/2 inch squares about 1/4 inch thick. Place polenta on baking sheet and brush with avocado oil. Cut cooked turkey bacon slices into 1 inch pieces and place on top of polenta. Bake polenta with bacon in 350 degree pre-heated oven for 5 – 7 minutes. Let polenta pieces cool for 15 minutes. In the meantime, slice avocado into 1/4 inch thick pieces and sprinkle with lemon juice. 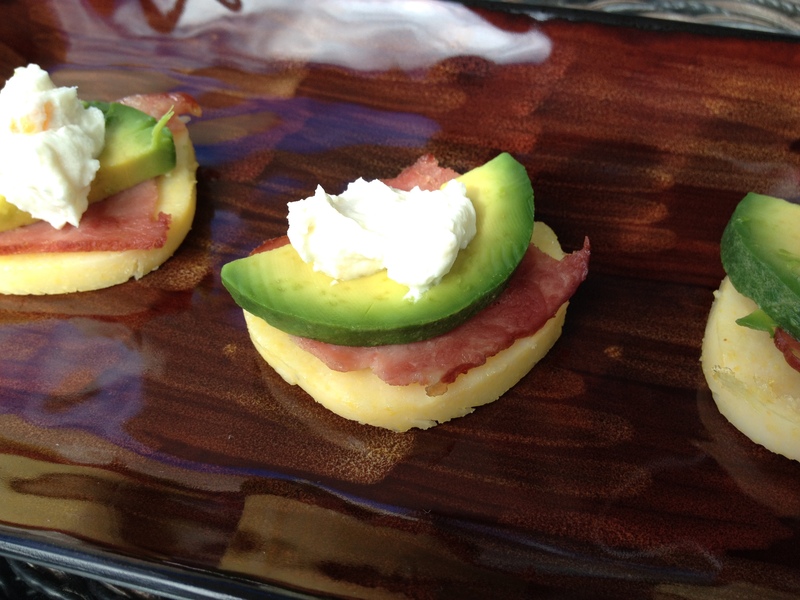 Place small dollop of goat cheese mixture on top of cooked polenta and bacon and then top with avocado piece. Note: These appetizers fall apart easily. For ease of handling, you could also crumble the bacon, or add 2 layers of goat cheese – one between the polenta and bacon and the other between the bacon and avocado.